Nearly everyone has heard of Wimbledon. It is the home of British tennis and the host of one of the world’s greatest tennis tournaments. Known as the home of tennis, the All England Lawn Tennis Association keeps this heritage and historical site moving into the 21st century. Wimbledon club is a great place to visit and if you can get tickets to the annual international Grand Slam tournament you’ll be able to enjoy a day out in the summer sun, with the obligatory dish of strawberries and cream, while watching some of the world’s tennis greats take to the centre court. Perhaps it is the tradition, pomp and ceremony that make playing, and watching tennis at Wimbledon something very special. If you watch interviews of the great tennis players, they will always comment on how special it is to play and win in the magnificent centre court of this magnificent tennis club. It’s not as large as other stadiums around the world, but there is a sense of history, English tradition and the splendor that goes along with that. If you’re not able to score one of the expensive tickets during the championship weeks, then visiting Wimbledon during the rest of the year is a great way to experience the history and tradition of the club. There are guided tours throughout the year and a fascinating museum right on the site. The guided tours last for about an hour and half and you will get a glimpse of the most recognizable areas of the club as well as a great behind the scenes tour. You can enjoy the museum before or after your tour, but be advised that you will have to book in advance to be included in a tour and the waiting list is quite long. 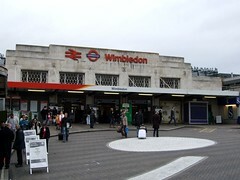 To get to Wimbledon for the day, you can take the tube to Wimbledon on the District Line or train from Waterloo to Wimbledon Station. When you arrive at Wimbledon take the No 493 bus directly to the club. If you are going to attend the prestigious tournament or visit at any time during May – August, always use public transport as there is very little parking in the area. It is gems like visiting Wimbledon that will enrich your life while you are living in London. So get out of your new London rental and explore the fascinations that the city of London has to offer you.